I have lived in the same general area my entire life, relocating from suburb to suburb outside of Chicago but always within a 15 minute drive of the place I call home today, a fine town called Downers Grove. Despite this, I had somehow managed to never step foot inside a wonderful old fashioned cinema that resides in downtown Downers, a place that still captures the magic I feared had been lost thanks to the dominant position held by bigger, corporate owned theaters. The reason a visit to the glorious Tivoli cinema had eluded me for so long was a combination of the fact that they usually featured films I had already seen by the time they screened there, and also just plain strange luck, with any number of planned first time trips called off for a number of reasons. As I walked in last night and reveled in the majestic size of their single screen theater, I felt as if I had taken a time machine back to when such unique venues more commonly existed. I wanted to soak in every little piece of what made the atmosphere so special. 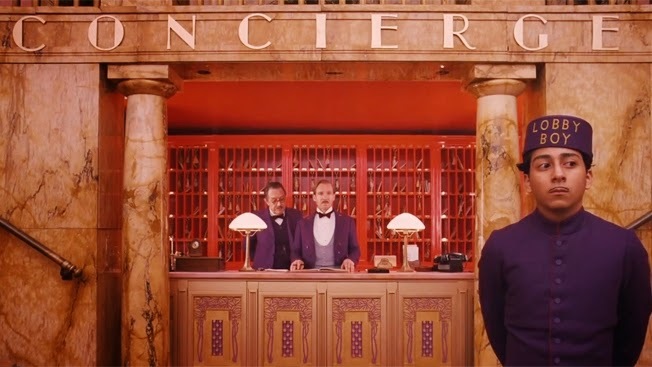 Speaking of a time machine, prior to the start of the film as I sat in my chair admiring the gorgeous architecture that surrounded me, I started thinking about my history with the work of the auteur Wes Anderson. I went back to the late 90's when I, a fat teenager with a strange sense of humor, discovered the films Bottle Rocket and Rushmore and I fell in love with the intoxicating and unique brand of comedy. My friends and I would quote those works endlessly, constantly revisiting them when we couldn't think of anything to do, always willing to dive back in to the worlds Wes created and search for more reasons to fall deeper in love. Despite this, as I prepared for my journey to The Grand Budapest Hotel last night, I was wondering if it would be the first time I would be willing to give full marks to an Anderson film, as even the ones I love most never seemed to deserve such accolades. I could practically bathe in the style of his films and yet still I had been unable to fully embrace one and toss around a word like masterpiece without immediately shooting down the notion. I cleared my mind as the cinema went dark and the show began, and fate would have it that such a marvelous feature would be my first experience in this setting. I knew immediately that I was in store for a special experience, and finally I can use the word with full confidence as Anderson has delivered his finest work to date: masterpiece. Often times it seems a filmmaker will be criticized for not working outside of his comfort zone, for not attempting to delve into a differing genre and dipping their toes into a new pool from time to time, yet I admire Anderson for staying the course and instead of going off the tracks trying to refresh his image, he has managed to absolutely perfect what he does best. If you don't get off on the quirky side of Wes, don't bother with The Grand Budapest Hotel, as he pulls out all the stops here by crafting something that even for him was unlike anything I have ever seen. The set pieces are equal parts drab and lavish, featuring a color palette that doesn't scream of beauty and yet the imagery danced in my eyes and delighted my senses. The costume design perfectly suited the material, the setting and the era in which the events take place, but not in a way that actually felt genuine. I never once felt like I was witnessing the 1930's, but instead I was always aware that it was Wes Anderson doing his best impression of such a time, which sounds like a bad thing but in reality it added to the magic of the picture. 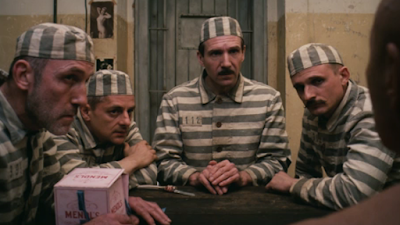 I have always kept an eye on the way Anderson frames his films, but something about The Grand Budapest Hotel seemed to be particularly brilliant in this regard. The subjects of each frame and their surroundings were so ideally realized that constantly throughout what was actually a motion picture felt like a series of paintings that I would hang up in my living room. The camera was often times in motion yet it did so with such grace and ease, always staying perfectly level and keeping the focus of each frame centered. I kept thinking that I couldn't wait to own this film so I could pause it and take a second to appreciate every inch of what is portrayed, because my eyes both wanted to follow the performers and understand their placement yet I also wished to pick apart everything Anderson put into the film, all the way to the slightest touches off in the distance. The one aspect I could always count on from an Anderson film is the quality level of the screenplay and his casting choices to give it life, and I certainly was not disappointed with these aspects of The Grand Budapest Hotel. In fact, I strongly believe what was created here is the most brilliant and inspired efforts of his long and important career, a film so impeccably written that I was constantly laughing out loud even at the most subtle moments. Even something as simple as a facial expression or the reaction of a character that was relegated to the background in the frame had me smiling from ear to ear, and the cast was expertly assembled, a combination of his usual players in surprisingly minor roles, faces that were unknown to me prior to this film, and also recognizable, astonishing talent like Ralph Fiennes, Jeff Goldblum, Harvey Keitel Adrien Brody, F. Murray Abraham, Jude Law, Saoirse Ronan, Willem Dafoe, and Tilda Swinton that defined perfection for the roles they played. In fact, Fiennes gives what is probably the single best comedic performance that I have witnessed in some time, delivering every single line with passion and conviction and displayed a genius for timing that is necessary to make material like this work. As you can tell, I could go on and on about this film, but I don't want the words to be rendered meaningless via overkill. 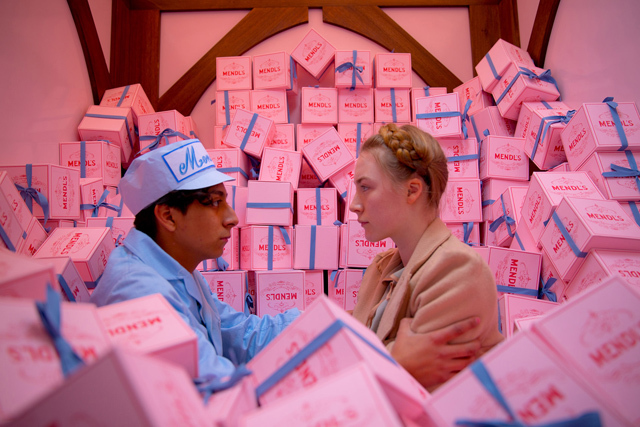 All I can say is, this is the finest film thus far of 2014 and the greatest thing Wes Anderson has ever accomplished. I loved it as I exited the beautiful Tivoli theater, wanting to head right back in and do it again, but after I went home the admiration grew even stronger. If this is the best we will ever see from Wes, at the very least I can finally say he crafted a perfect film.